A new sandwich chain is looking to enter the Northwest Indiana market. Wisconsin-based Erbert & Gerbert's plans to open two Hammond locations in the next three years, the company has announced. The restaurant is still scouting out real estate and does not yet have locations picked out, spokeswoman Erin Hudec said. The 26-year-old restaurant company, which is headquartered in Eau Claire, specializes in unique flavors, such as cranberry wasabi chicken. Erbert & Gerbert's is just the latest chain to add restaurants in Northwest Indiana in the fast-growing sub sandwich segment. Jersey Mike's and Firehouse Subs also have recently opened stores. Consulting firm Technomic has found that 96 percent of consumers polled buy sandwiches at least once a week. Erbert & Gerbert's currently has 63 locations, mostly in the Midwest and Great Plains states. The company is pursuing aggressive growth in Indiana and plans to add eight to 10 new locations across the state, it announced. Additional franchises are expected to open in Michigan and Texas. Da Beef wrote: I dont know where "Chicagoland" ends in the Northwest Indiana region or if this post belongs elsewhere but since this is such a useful thread and has stuff from Michigan City in it, why not here? Supper Clubs are a big part of Wisconsin cuisine but they extend throughout the Midwest. Take the Heston Supper Club in LaPorte Indiana as example. I stopped in a couple weeks ago and enjoyed the ride to get there down some random road with no other businesses around. This is also the case for many supper clubs found in the Northwoods of Wisconsin and Minnesota. Upon pulling up it had the feel of an authentic supper club and sure enough on that Saturday night around 7p it was packed with only a few parking spots in the large lot next door. You get the same authentic feel when you walk inside the building that was once the center of town in Heston, Indiana. At first a creamery it then turned into a general store followed by a tavern and now its a supper club. 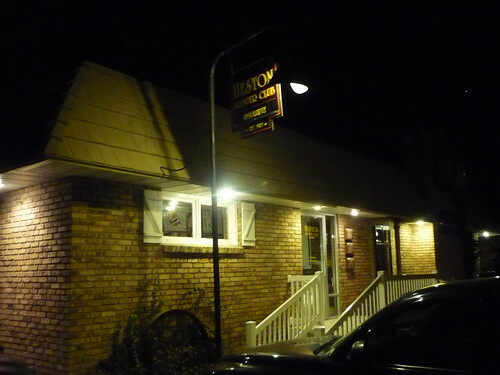 The original Heston Bar was purchased by the current owners in 1982. They added 'supper club' to the name in 2000 when they decided to add that element to their property. They got the vibe and good practices of great supper clubs down pat. Just like a few other supper clubs I've been to there is no eating at the bar which is used for those waiting to be seated but still in need of a drink. 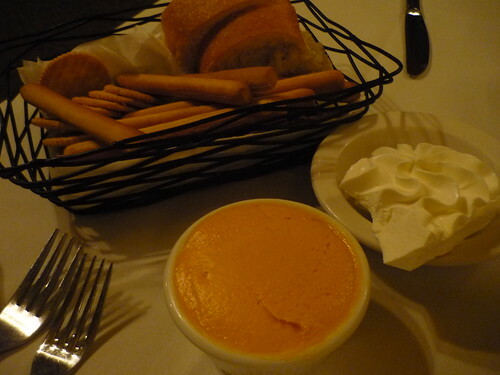 Right after your menus are brought out upon sitting down the sharp cheddar spread comes shortly after. Good stuff similar to Merkt's although they make theirs themselves. The menu is what you would expect and includes a perch dinner which I got to try a little bit of but was just ok compared to other places I'll post about in a perch report coming soon. 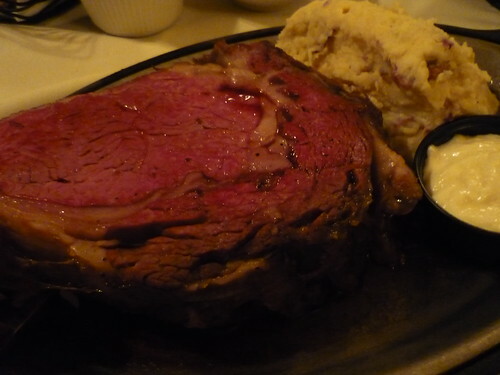 The prime rib however was top notch and as good of a piece as I've had in a while. I'll be adding the Heston and their perfect piece of red meat into the rotation of summer spots to eat at while kicking it in Long Beach. With my meal came a choice of soup and their beef vegetable with hunks of prime rib was very hearty. The only thing I wasn't able to confirm is if they make an Old Fashioned the right way. Next time. Had a blast here the other night. My folks used to be Saturday night prime rib aficionados before they went health-obsessed in the 90s. We hadn't been back to Heston (then called Bar) Supper Club since. Everything Beef recounts above remains true to the place– off a dark and winding stretch of country road, a beacon of country warmth, hospitality, and giant quivering slabs of beef. I ordered the old fashioned– the genial old school bartender asked me my choice of booze, I said I'd like what's traditional, in this case rye and he made a point to mention that his version of the "original" old-fashioned has muddled lemon peel and not orange. In any case, it was for certain the best version I've had, pronounced bitters and light on the sugar, my kind of cocktail. You have to be careful with the cheese spread and very good selection of crackers. Filling up on that and anticipating huge prime ribs, we skipped apps, which is a shame because shrimp cocktail did seem apropo. I subbed a Maytag wedge (on special) for a house salad. It was modesty sized and had a lovely house made blue cheese dressing. We all went with the "modest" prime rib weighing in at 14 oz. The Flinstonian cuts that arrived to our table seemed easily double that size. As a side note, you can order up to 40 oz. cuts, which a longtime carpenter that works for my old man would dispatch of on the regular. Even my folks indulged, though none of us finished more than half of these luscious, bloody hunks. Horseradish mash had a nice twang and made a great vehicle for all that bloody jus. What a great spot– I would call it a throwback, but considering the very evident popularity, I'd count this as a relevant institution of this area. Heston is great. Probably the single best all-around example of a functioning roadhouse/supper club I know. No need for asterisks or apologies to explain why it is good; the kitchen would be praiseworthy in a strip mall, let alone an historic old joint. No mustiness and just the right dose of nostalgia. Not cheap, though. Timbrook Kitchens specializing in sweet & savory pies and cheesecakes has opened a storefront location in Munster,In. These are the same people who have been selling their baked goods at the Munster,Valparaiso,and Chesterton farmers markets. 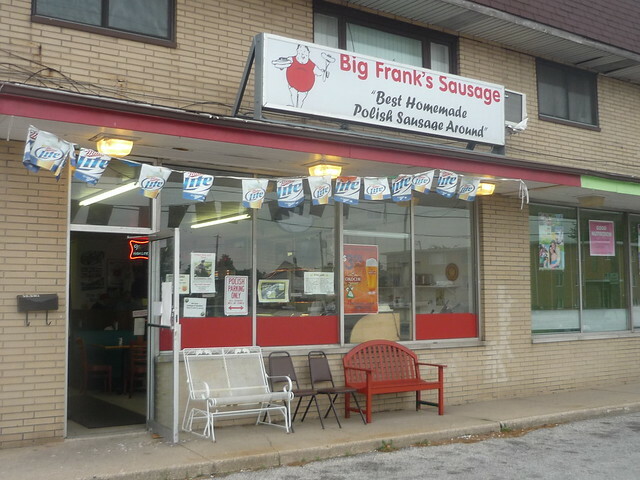 About a stones throw from deep fried tacos at Adrian's is Big Frank's Sausage where the sign outside proclaims "Best Homemade Polish Sausage Around" They make for a nice 1-2 punch followed by a fill up at Speedway a few blocks away. 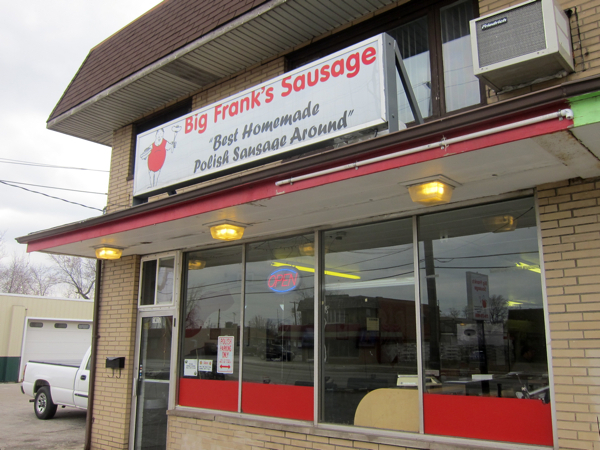 You might not be able to catch it in the sign outside but Big Frank's also doubles as a bar. 20 oz drafts of Okocim are $3.50 everyday. If you wanna get the party started a little bit quicker they also sell "Polish Bombs" which is a Okocim draft served with a shot of Nalewka Babuni cherry wine. I didn't try one so I'm not sure if you're supposed to drop the shot in the beer or not but I would assume so since it's a bomb. 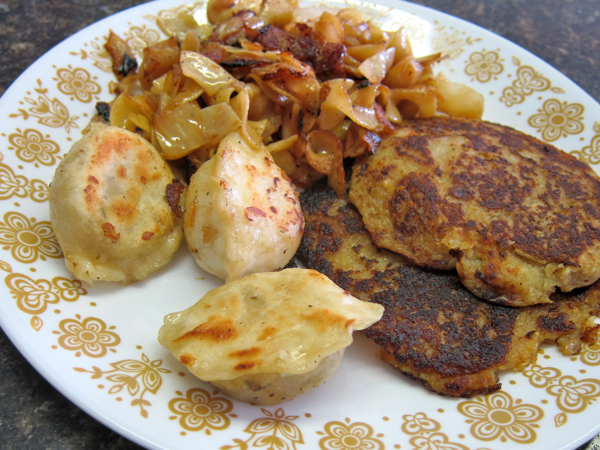 We did sample the house specialty as well as some potato pancakes with a couple pierogi and an order of beef Uszka (Mini Polish Dumplings). 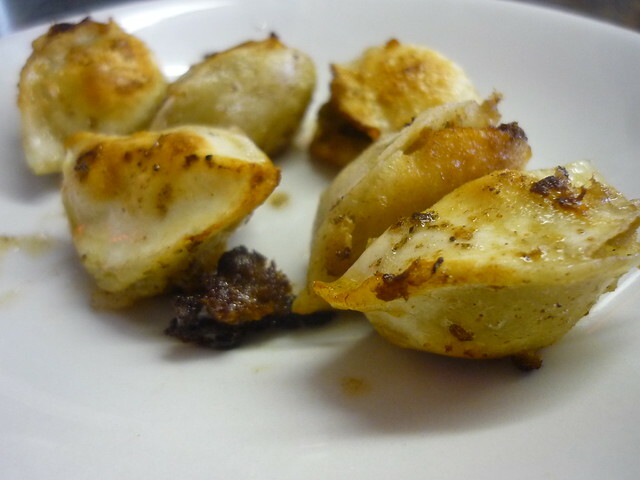 Mini Meat Dumplings - I loved the fact you can order these by the piece ($.25/each) as they make for a great beer snack. These, the pierogi and sausage are sold ready to cook or frozen too. 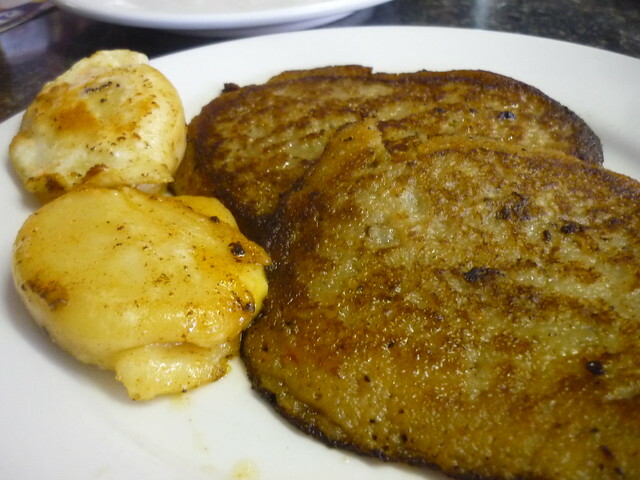 Pierogi and Potato Pancakes - Both decent versions, although the pancakes were a bit greasy, not all that different from Cavalier Inn one town over. Polish Sausage - Links are fresh (not smoked) and have nice hints of garlic and pepper. I thought it was quite tasty. All this food and three Okocim came out to less than $20. Nice neighborhood place. I don't see any discussion of Tapas Cafe in Merrillville, and that is a crying shame. They are hidden in a strip-mall next to a nail place and a massage parlor that looks a bit shady, and don't make a great impression aesthetically (the sandwich board on the roadside simply says "TAPAS SPAIN FOOD"), but they'll be your new favorite spot if you, as I did, finally work up the gumption to eat there. I am always, always too excited to eat their delicious food to take a picture, so you'll have to trust that the food looks as good as it tastes. 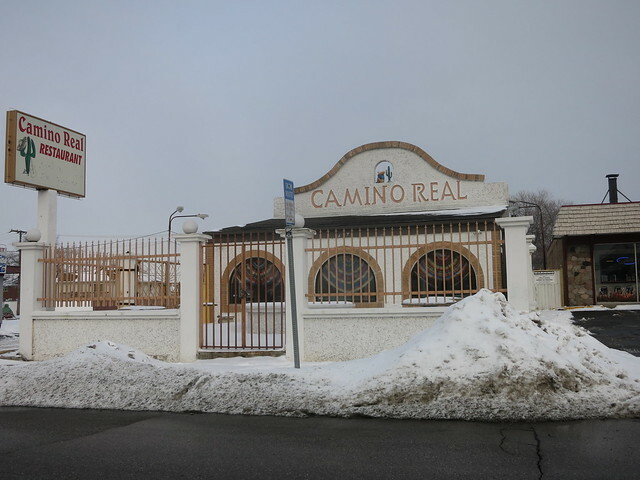 The food is traditional Spanish tapas with Basque and Mexican influence, created from scratch and served in generous portions for modest prices. Highlights include potato croquettes seasoned perfectly with a lightly spicy sauce, awesome ground beef and potato empanadas, and, if they're available, the best iteration of bacon-wrapped dates in memory. Tonight the chef was making tacos al pastor, a trial to see if they make it to the main menu, and it will be a crime if they don't. I love their small plates so dearly that I rarely have an appetite - or large enough crowd - to enjoy their entrees or paellas, but when I do they don't miss, particularly a lemon, caper, and artichoke paella that I am struggling to remember their name for. All their seafood dishes are artfully prepared instead of cooked to the point of ruin, as is more common around NWI in the opinion of this West Coast transplant, but the calamari is a standout. The place is family-owned and I have been met with nothing but kind, warm, open service. Both husband and wife are accomplished chefs, but you'll most often him in the kitchen and her serving and prepping; eat there a few times and you might as well be family, too. They are BYOB, but, a word of advice: they don't ever seem to have a corkscrew - so, unlike me tonight, remember to bring one of your own. Heavens, I am positively gushing, but I haven't had any bad - or even mediocre - experience here. Anyway, don't take it from me: take a chance on this hole-in-the-wall, and you won't regret it. Artie wrote: Timbrook Kitchens specializing in sweet & savory pies and cheesecakes has opened a storefront location in Munster,In. These are the same people who have been selling their baked goods at the Munster,Valparaiso,and Chesterton farmers markets. Yes you can dine in or carryout. "... a good dinner is of great importance to good talk. One cannot think well, love well, sleep well, if one has not dined well." Was out in Dune Acres on Saturday and we had planned to stop (or go a little out of the way) for a fill up the stomach breakfast at the awesome Scrambled Diner in Dyer until I remembered about a place I've been meaning to try called Indy Cafe. This farm to table spot is ran by a young man and woman duo who do all the baking of breads and smoking of meats etc in-house. They also have what looked to be like a nice coffee and tea menus and offer live music on some days. There's definitely a different vibe than most of the other spots around here. The mostly sandwich focused menu switches up with whats good at the market. There were at least a handful of items on there that caught my eye. We ended up having an excellent lunch that will for sure make this place a regular in my rotation when out this way or riding by en route elsewhere. 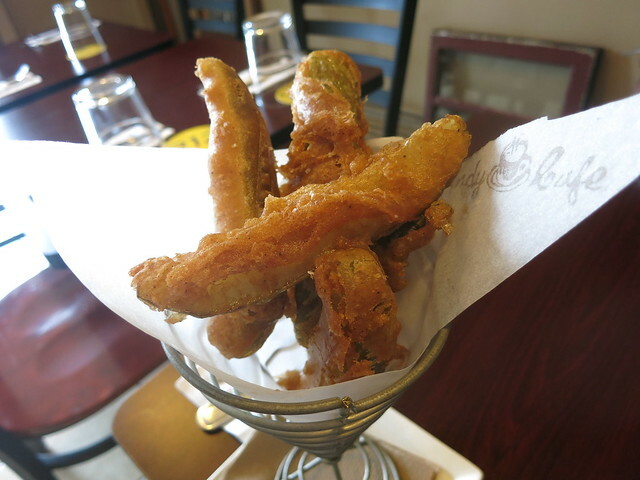 Fried Pickles - Despite the fact I'm not a big fan of fried spears these were spectacular. Crispy batter that stuck together on the outside with a juicy pickle inside. 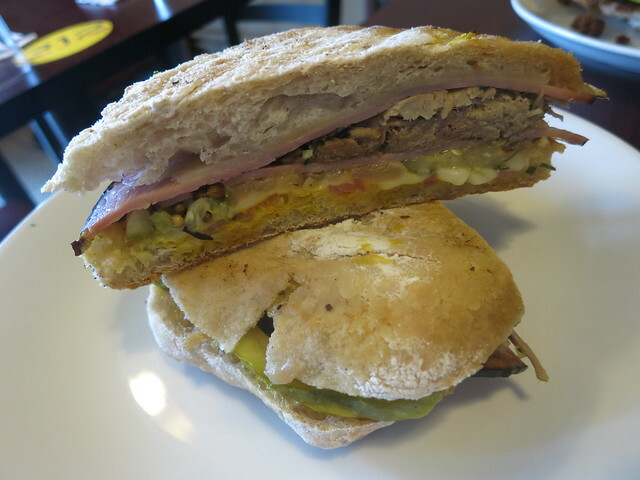 Cuban Sandwich - Might not of been traditional but man was it good. The pulled pork had a really nice herbal essence going and the ham, cheese, pickles and bread were all top quality. Not to mention it was stuffed top to bottom. Chicken Milanase - Served w/ pickled red onions, pepper-jack and spicy aioli this was the best fried chicken sandwich I've had since the craze in Chicagoland began and I've been to them all. It was expertly fried, well sized and came with a more than fair $8 asking price. Very nice. Da Beef wrote: Was out in Dune Acres on Saturday and we had planned to stop (or go a little out of the way) for a fill up the stomach breakfast at the awesome Scrambled Diner in Dyer until I remembered about a place I've been meaning to try called Indy Cafe. Are they open for dinner too? Would've come in handy yesterday since we had a game at 7:00 in Whiting and couldn't find anywhere to go!!! boudreaulicious wrote: Are they open for dinner too? Would've come in handy yesterday since we had a game at 7:00 in Whiting and couldn't find anywhere to go!!! Thanks for the list but, if you scan down it, there are only a couple of non-bar, non-pizza spots open at 7:00 on a Sunday. We didn't want to go to Grillers (didn't like the menu) and read nothing but awful things about San Luis. But thanks for trying! boudreaulicious wrote: Thanks for the list but, if you scan down it, there are only a couple of non-bar, non-pizza spots open at 7:00 on a Sunday. We didn't want to go to Grillers (didn't like the menu) and read nothing but awful things about San Luis. But thanks for trying! Sorry if I came across as a know it all. You're absolutely right, boudreaulicious;Sundays are roll-up-the-streets early in Whiting. If they ever open that restaurant in Whiting Park,I hope it's open late every day...and if it were the Phil Smidt's of the good ol'days that would be perfect! Farm-to-table is a pretty popular concept these days, and a new restaurant takes it about as far as it can go, growing and raising almost all its food right outside. Fair Oaks Farms has opened The Farmhouse Restaurant and Conference Center, an $8 million expansion at the popular agritourist destination in Newton County. The 20,000-square-foot complex includes a local craft beer pub, a conference center that seats 280, and a sit-down restaurant with an emphasis on American Farm Cuisine, and will add a fresh food market and bakery later this summer. Visitors to the sprawling farm and agricultural education center at exit 220 on Interstate 65 have always been able to grab a grilled cheese sandwich made with dairy produced on-site. But Fair Oaks Farms is graduating to more grown-up fair. The focus of the 265-seat restaurant – helmed by Carl Bruggemeier, a nationally renowned and James Beard Award-winning restauranteur who has run the Tavern on the Green in New York City and Commander's Palace in New Orleans – is on freshness. How fresh? Eventually, 80 percent of the menu ingredients will be raised on Fair Oaks Farm or by a select few other local growers. The farm is already supplying dairy, pork and beef to the restaurant. Fair Oaks Farms says it is the nation's first large-scale "Our Farm, to Your Plate, In Our House" dining concept. 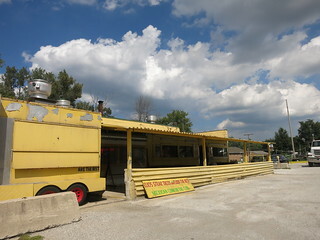 On the way back from a weekend at Turkey Run State Park, we stopped at Don's Drive In in Kentland (perhaps an hour south of Gary is a bit less NW Indiana than others on this thread). It's a classic drive-in with rows of awnings over parking spots and intercom ordering; we were happy to see a few picnic tables so we could stretch and get out of the car. Good cheap food. The "Jumbo Burger" comes with a 3-part Big Mac-style bun, two patties, cheese and slaw (a zingy creamy variety) for $3.30; twenty cents more gets you a pork tenderloin sandwich appropriately larger than the bun (lettuce tomato onion ketchup mustard pickles). Fries were frozen 'coated' variety but well cooked, onion rings also perfectly crispy. A Chocolate milk shake tasted of real ice cream and was quite good. 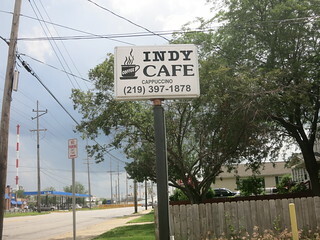 Made another visit to Indy Cafe (seen upthread) in East Chicago on the way to the Michigan City area this weekend. It's a quick 4 minute drive off the Skyway. This is a real gem in the middle of the Region where blue collar America still lives strong. It'd fit right in somewhere over on Logan Square. 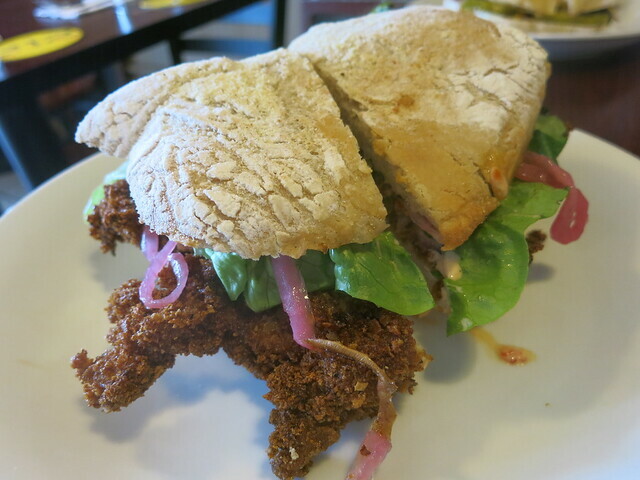 Chicken Milanese was as good as it was the first time around and remains my favorite fried chicken sandwich in Chicagoland. 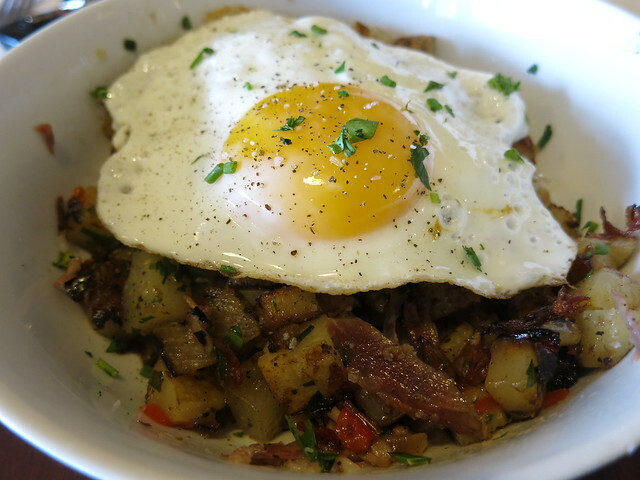 We split that and I got a side order of Made in-house Pastrami Hash which at $5 was fantastic value. Perfectly fried bits of potato soaked up the fat really nicely. I got five more Mexican restaurants that fit into the category of American-Mexican dining in Da Region. 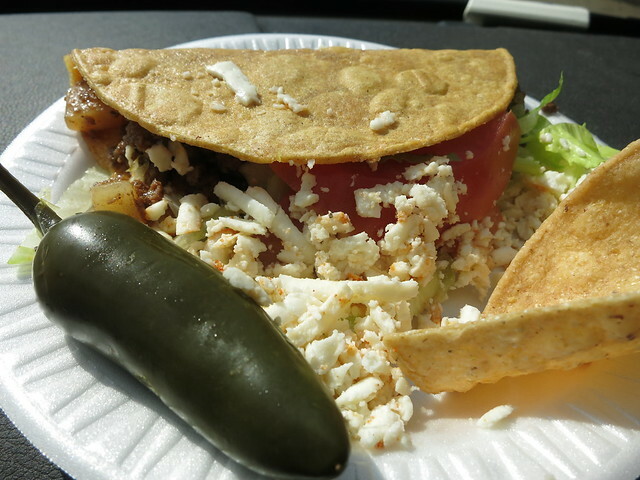 In case you missed it or cant remember you can go back to page 11 of this thread and see that I've been exploring the areas Mexican food scene, as it's rich with it, and many of the spots date back to the 60's and 70s or 80's. 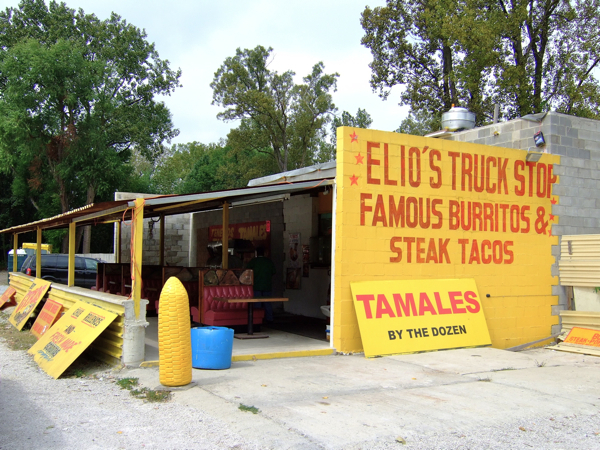 I am very aware of what constitutes "authentic" Mexican food but I've been saying it in previous posts, I'm not going to tell the Mexican families behind these spots that their cooking isn't real Mexican food. Instead I choose to place it in the genre of Americanized Mexican which can still be good for those of us who cant ever get enough tacos. Today's five stops are interesting when it comes to them. Cruising down US 20 I noticed this bright yellow truck stop advertising both tacos and hot dogs and couldn't help myself from pulling a u-turn to see what was up. Upon pulling in I noticed several signs sporting their slogan of "Steak Tacos on Flour are the Best" and that was all I needed to take my behind inside and try one. This seems to be a San Diego style taqueria that doubles as a Chicago hot dog stand. They have all the regulars from the latter as far as Polish sausage, gyros, Italian beef etc and I also noticed steak fries on the menu but at $12 they weren't cheap and I had no idea of the quality of the meat so I stuck with a steak taco on Flour. Upon opening the wrapper I wasn't high on this one as the meat was somewhat mysterious though not scary enough to dump it. I took a bite and was actually surprised as the flavors and texture were better than they looked. I prefer corn but will never look down on a taco made with a flour tortilla, in fact sometimes I feel like one of them though I usually just make them myself. A mile or two down the road on US-20 will take you past this longtime locals favorite. I cant find an exact date when they first opened up shop but believe it was sometime during the 70's. The menu here is pretty small with both soft and hard tacos joining Polish sausage, burritos, tostadas and tamales. 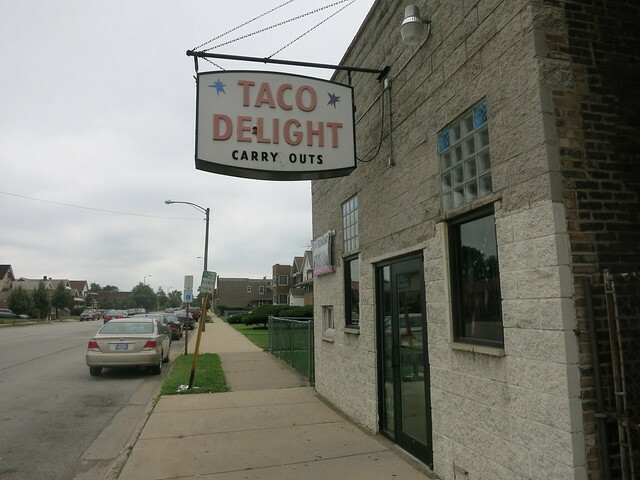 I was kind of surprised to see that their tacos are on-par price-wise with the designer tacos of Chicago etc. One "hard" as they're called will set you back $3.01, don't expect a front on the penny if you don't have it. To-go orders are still served on paper plates with some tin foil covering it before going into the bag. I opened this one and soon realized hat these were bigger than your average hard shell taco and also made with thick chunks of potato that were blended into the ground beef mixture while the shell was freshly fried. 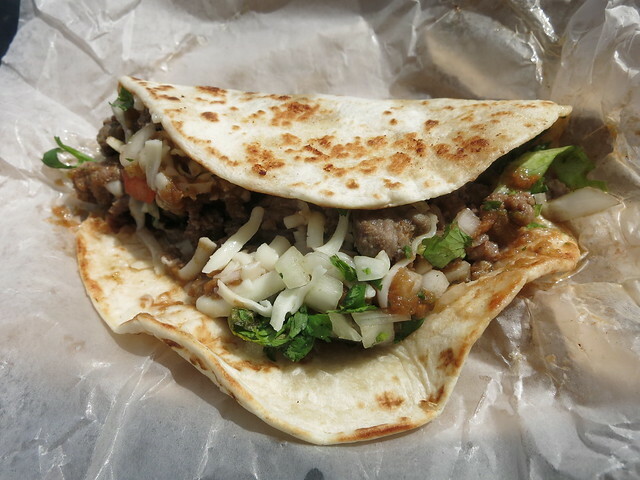 As far as American-Mexican tacos go this was a pretty good one in that every now and then guilty pleasure sort of way. I wondered why they chose to include just one tortilla chip but figured that out after finishing my taco. You use it to scoop up all the stuff that fell out upon eating. Another longtime locals favorite this is strictly a to-go operation with bullet proof glass separating you and the workers. A sign inside thanks customers for being there since they first opened in 1962. 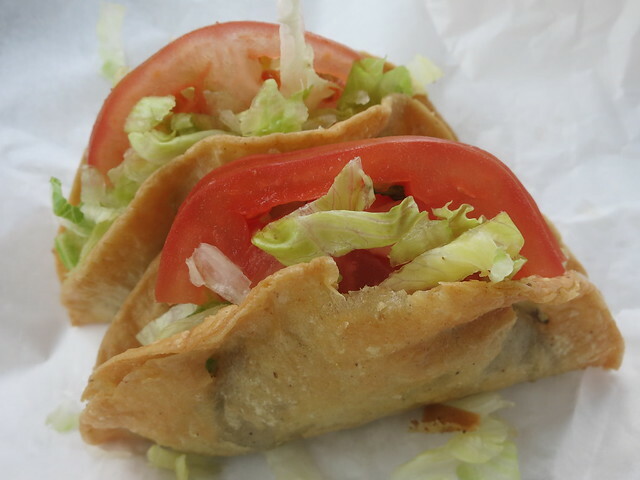 Some online searching led me to believe they were serving the famous deep fried tacos found across the region and I was right. Unfortunately these were the worst ones yet. I couldn't quite pinpoint what was off about them but the beef was dry and tasted lifeless. The red salsa that was more like ketchup didn't help either. Never thought I'd find a DFT I didn't like but that was the case with this place. Here's a random spot I came across while working out this way last winter. I noticed this place advertising both mexican and Puerto Rican food while driving by and decided to give them a try. I still couldn't figure out if it's Mexican or Puerto Rican owned but I'd put money on the latter as it makes more sense than the other way around. Anyway I noticed something called a "stuffed taco" on the menu and asked about them. These are made by taking two flour tortillas and melting some Muenster in between them and then using the quesadilla as the tacos tortilla. I tried one with pork as she said that was their most popular item and I could taste why. This was really good, maybe not traditional but all I was looking for was good taste and these had that. The pork was aggressively seasoned and extra tender while the toppings worked well with everything else molded together, I almost went in for another. Shout out to the commenter on my blog who mentioned that I missed this place when doing my original round-up. Housed in an old fast food shack they've been around since the late 70's and are a locals favorite as the commenter had mentioned to me. She was from the area but now living in Rogers Park and had said these were what she missed most about home. I could see why. 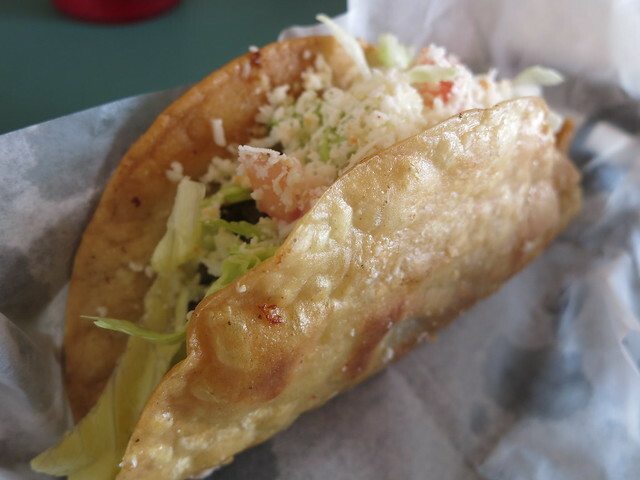 This was a very good taco dorado, pan fried with the ground beef inside the shell, it came out about as crispy as one can get. Extra props for the spots that use the shredded cotija cheese over the American-Mexican blend, I prefer that with crispy's. Their burnt ends are exceptional. It's like dessert. 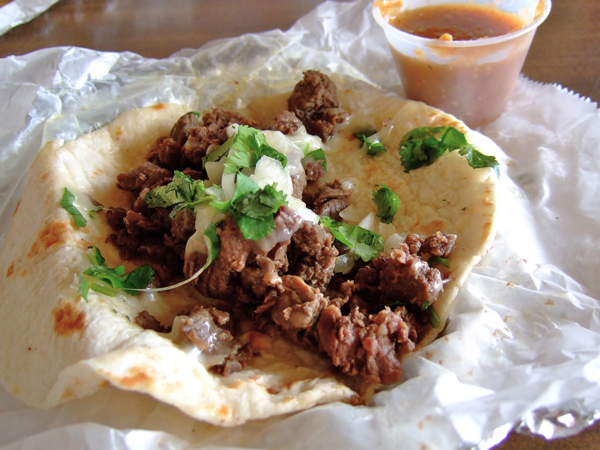 Never had anything quite like it -- and I travel to Austin quite a bit! Their sides are a little on the pricey side -- but if it's the daily special, we always get the mac & cheese. A small serving, maybe cupcake sized, but so rich and delicious that they're probably doing us a favor with smaller serving sizes. We were excited for the launch of True BBQ & Whiskey Bar (8940 Calumet Ave., Munster IN; former site of The Charley Horse) a few months ago, and went there maybe two weeks after it'd opened. Disappointed. The atmosphere was upscale (a pleasant surprise and change from the earlier establishment), and the presentation was really nice, but it gets down to the food -- and it came across as pretentious, and just not very tasty. Especially at the price. We haven't been back, though I'm always willing to give BBQ a second chance, would love to hear from others who have been! 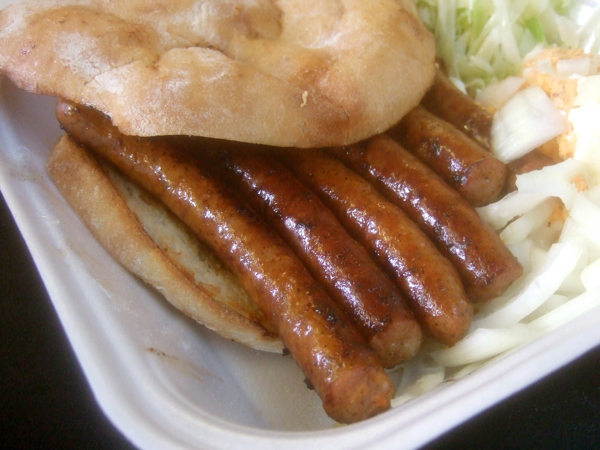 Balkan Grill in Gary is on my shortlist of best places in Northwest Indiana. 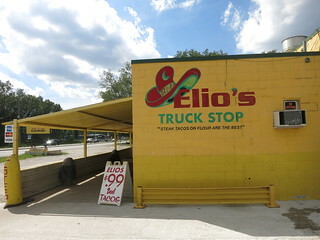 It's an interesting place, a true truck stop that caters to Eastern European long haul truckers wanting some home cooking. It's less than a half mile south from the Grant Street exit on I-80/94. 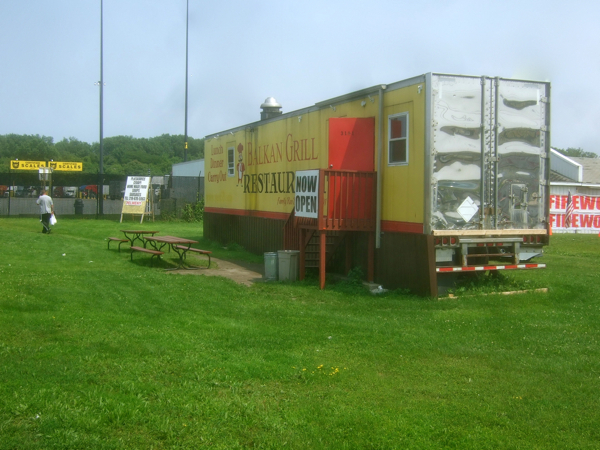 The restaurant is refitted semi-trailer, set in a small grassy area between a large, busy truck stop and a fireworks store. 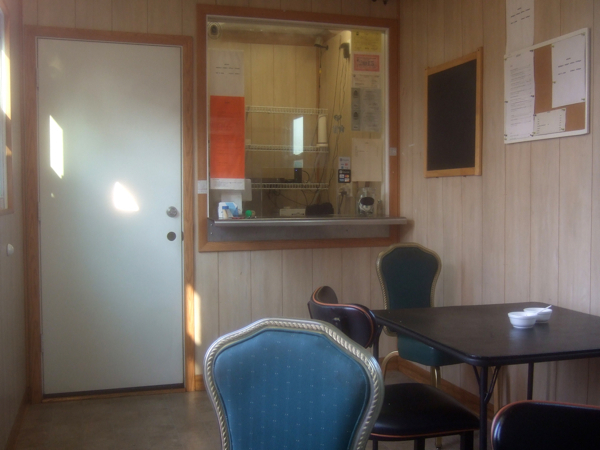 Much of their business is takeout for truckers who phone ahead (everything is cooked to order and takes 15 minutes), but the interior has a couple small tables and some picnic tables are outside. 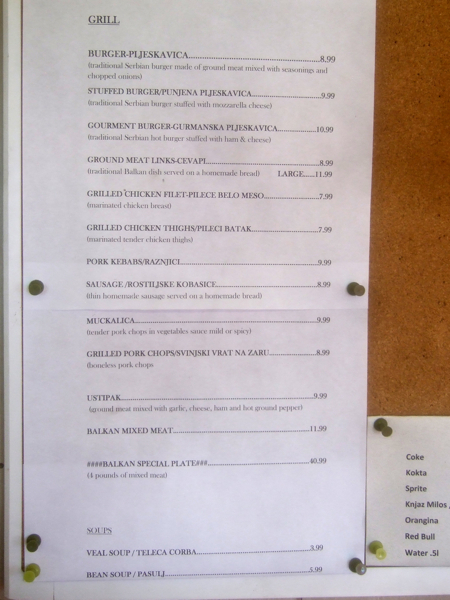 The menu reads like the greatest hits of Balkan grilled meat. The Balkan Mixed Meat plate comprises a boneless chicken thigh, pork steak, pljeskavica, one ćevap and a link of smoked sausage. A heck of a lot of meat for twelve bucks. The cook clearly knows what he's doing—every piece had a nice sear, but remained juicy and delicious. The accompaniments are notable as well. The homemade lepinja was great, and became even better when soaked with the meat juices. Kajmak, with a crumbly yet buttery texture, had to be freshly made as well. The urnebes, sort of a spicy feta spread, was terrific too. Even the basic cabbage salad was well executed. Simple food perhaps, but prepared with skill and care. The food was so good we returned later in the day for more (mostly to take home). A full order of those homemade smoked sausages (rostiljske kobasice) and a plate of ustipak, something I don't recall having before. Those sausages are really good, and intensely smoky. Ustipak is a lovely patty of ground meat enlivened with garlic, cheese, ham and hot pepper. Salty, spicy, greasy and absolutely delicious, though I can hardly imagine eating an order of five by myself. 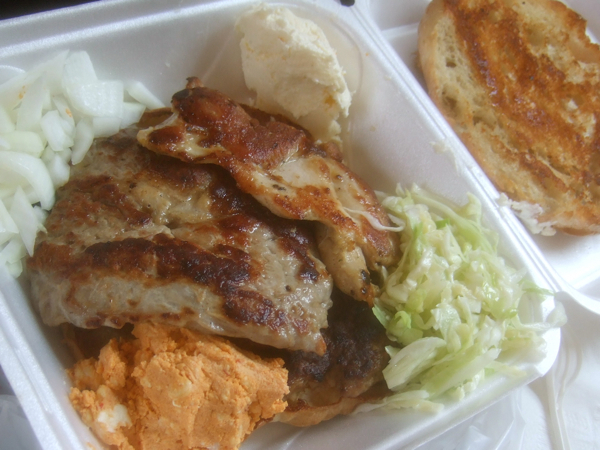 I haven't been eating too much Balkan food recently, so I'm unfamiliar with many of the current offerings in the city, but even so I'd have to rate Balkan Grill with the best in Chicago. I'd consider it a destination in itself. If you're heading out of town on I-80/94 it would be a great stop. Grab a liter or two of Knjaz Milos (a bargain at $2), an excellent sparkling mineral water from Bosnia, for the road. 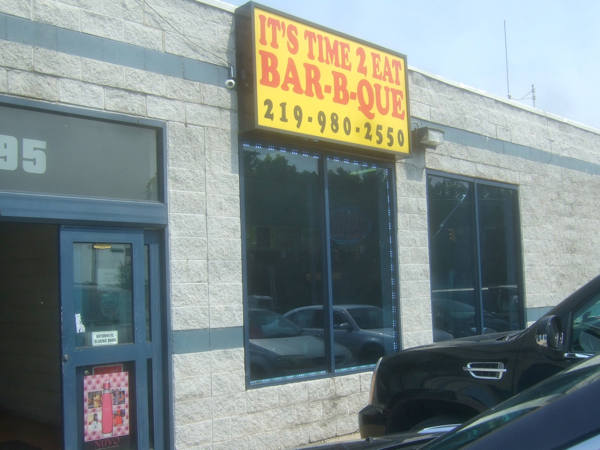 A few hundred yards south of Balkan Grill is a tiny strip mall with It's Time 2 Eat Bar-B-Que sharing a doorway with Champ's Liquors. It's Time 2 Eat actually looks promising, with a nice Chicago-style pit pumping out smoke. We tried some ribs and jerk chicken tacos. Ribs were somewhat edible, but if you need barbecue in Gary, I'd suggest going to Big Daddy's. 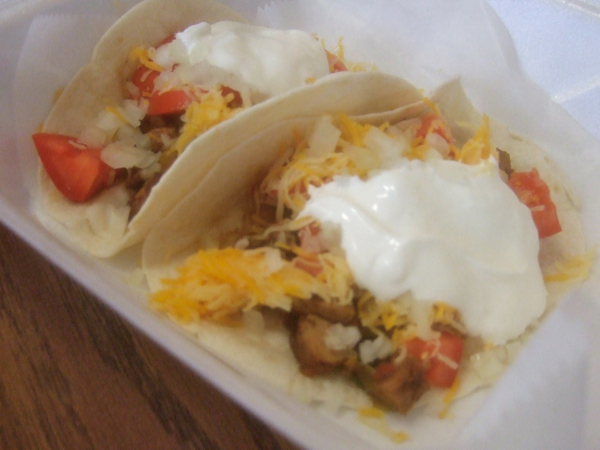 Jerk chicken tacos were notable primarily for being served in Gary, but better versions can be found elsewhere. The chicken filling—if you can find it under all that sour cream—was rather tasty. 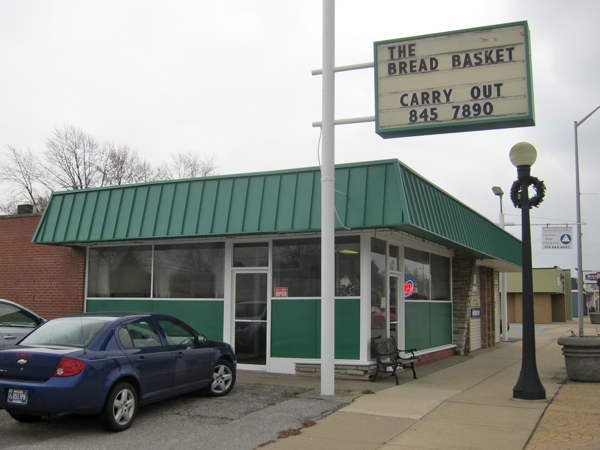 In another thread, SMT wrote: Another good lunch option in Hammond is The Bread Basket, 7205 North Indianapolis Blvd., a few block north of I80/94. I love their chicken salad sandwich and the seasonal sandwiches they come up with too (A few years ago around Thanksgiving they had a turkey sandwich with fresh cranberry sauce that was really good.) Of course they have lots of other good options made with the fresh bread that I believe they still make on the premises. The country kitsch atmosphere may be either a little too feminine or just adorable depending on who you ask. It took only eight years for me to follow up on this recommendation and get to Bread Basket. 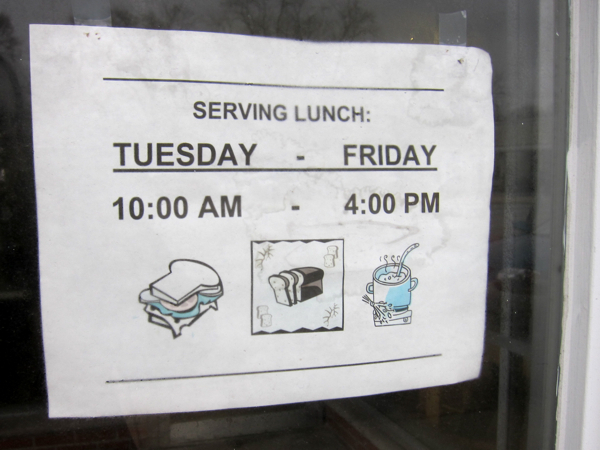 That's the main reason for the delay: they're only open for lunch four days a week. 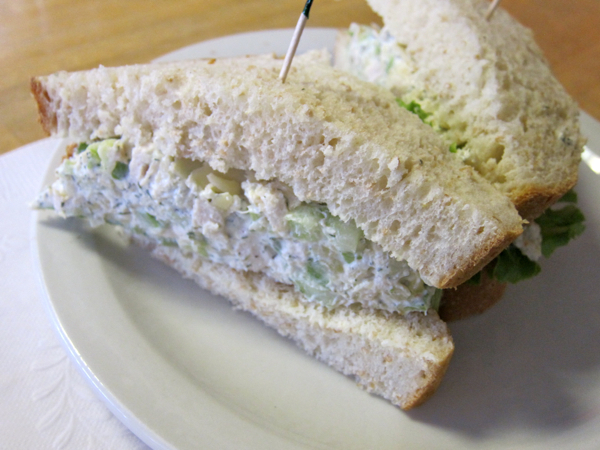 Good chicken salad, clearly made from a bird, enhanced with chopped celery and almonds. Good bread too, though I think I'd prefer it toasted. 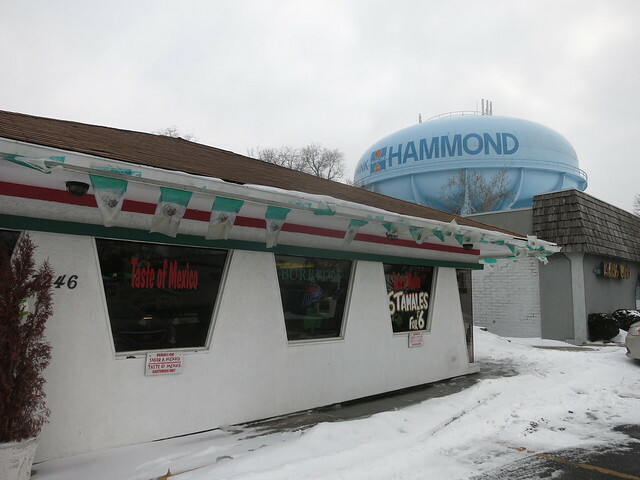 In another thread, The Regionrat wrote: The Bread Basket in Hammond has very good food. The rueben is excellent. 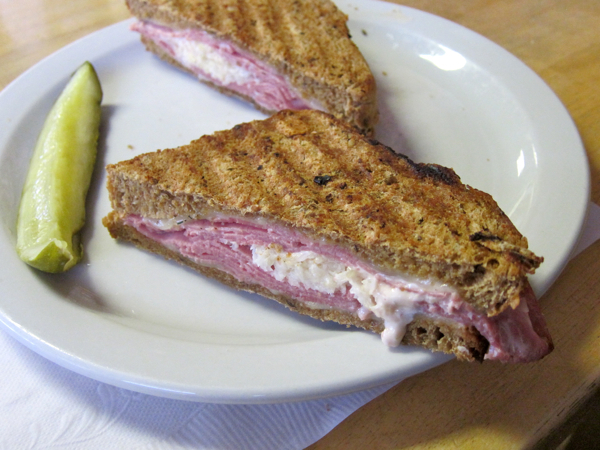 I enjoyed the sandwich, but it would probably be best to think of it as something other than a reuben. 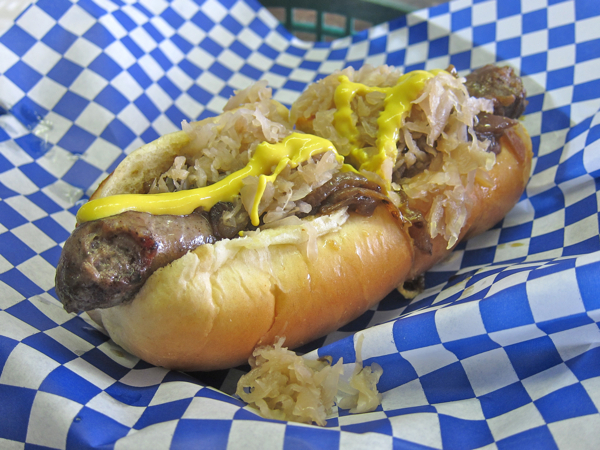 It has slaw instead of kraut, no 1000 island, and gets dry toasted rather than griddled in butter. Still, a nicely proportioned, flavorful sandwich. It seems I took too long to post. 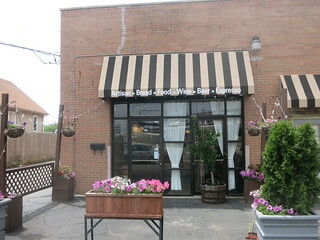 A month or two ago, Bread Basket closed permanently. That article from The Times I linked to mentions the surprising fact that Bread Basket milled their own flour since they opened in 1986. It's a shame they closed. I enjoyed visiting this slightly odd bar-deli hybrid. 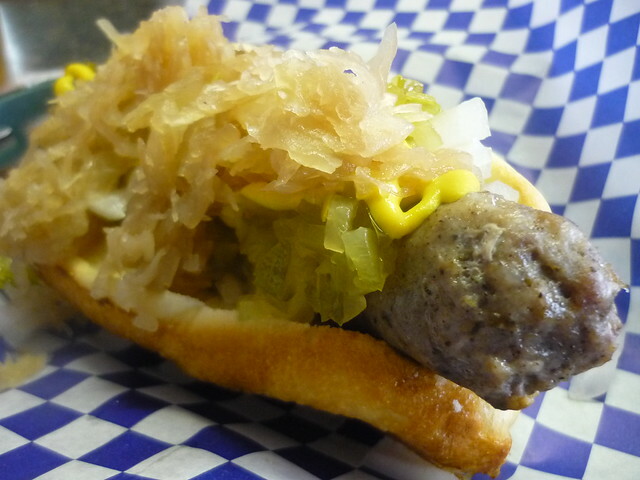 The unsmoked Polish sausage was tasty, though quite loose-textured and crumbly. I think one could be very happy with the food if it were freshly prepared. Our timing must have been bad because everything on the combination plate seemed reheated, and not very skillfully. The leathery pierogi were actually difficult to cut through. Sure can't complain about the prices though. Da Beef wrote: Cruising down US 20 I noticed this bright yellow truck stop advertising both tacos and hot dogs and couldn't help myself from pulling a u-turn to see what was up. Upon pulling in I noticed several signs sporting their slogan of "Steak Tacos on Flour are the Best" and that was all I needed to take my behind inside and try one. This seems to be a San Diego style taqueria that doubles as a Chicago hot dog stand. 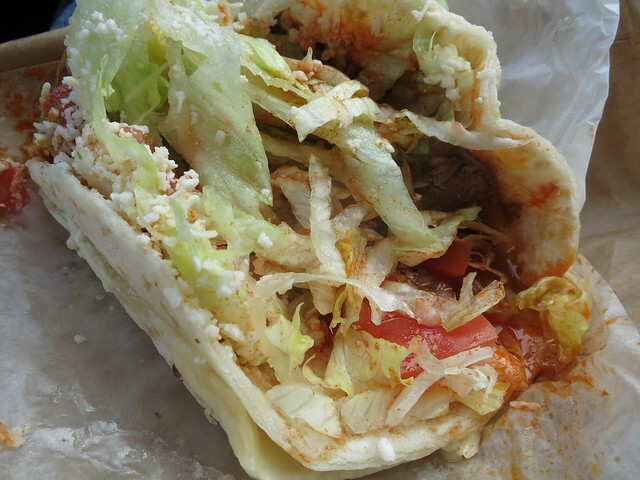 They have all the regulars from the latter as far as Polish sausage, gyros, Italian beef etc and I also noticed steak fries on the menu but at $12 they weren't cheap and I had no idea of the quality of the meat so I stuck with a steak taco on Flour. Upon opening the wrapper I wasn't high on this one as the meat was somewhat mysterious though not scary enough to dump it. I took a bite and was actually surprised as the flavors and texture were better than they looked. I prefer corn but will never look down on a taco made with a flour tortilla, in fact sometimes I feel like one of them though I usually just make them myself. Elio's must be doing something right to stay in business as long as they have. Until I saw your pics I'd kind of forgotten about my visit back in '06, when they were expanding. Doesn't sound like a lot has changed. I liked the steak-on-flour (came standard with a little cheese) more than I expected from appearances. Decent tamal as well. Had a better than expected breakfast at a relatively new spot in Dyer called Benedict's. Great apple pancakes topped with rough chopped pieces of well-caramelized, skin-on baked apples and a perfectly turned out eggs Benedict. Nothing fancy but better than any of the other options in the area--and I've suffered thru them all. I'm sure we'll be back. Two different Serb fests going on this weekend run thru Sunday. Why they would schedule them on the same day is beyond me. A very happy first and definitely not last visit to Indy Cafe this weekend. This place should be in the regular rotation for folks heading out to Indiana and Michigan. We stopped in just before noon on Saturday and after seeing the prices and confirming the meats are smoked in-house and the bread baked in-house, went a little overboard. The prices are skimpy but the portions are not. A couple of things not pictured - the candied bacon pancakes which I didn't try but were reportedly very good and the pastrami hash Da Beef described above that was studded with some really nice peppery pastrami. The guajillo chilaquiles were a real crowd-pleaser. The chips were soft but not soggy and the sauce had a nice little kick that made all 3 of us want to keep coming back for more. The croissant itself was good. Not going to blow anyone away but it more than did the flaky and buttery trick on this sandwich. The tomato jam is on the sweet side, a little too much so for my liking, but I still really enjoyed the sandwich. The chicken and biscuit was the big winner of the meal. The juicy fried chicken with a almost crunchy and flavorful crust was great on its own and even better on the herbed buttermilk biscuit. 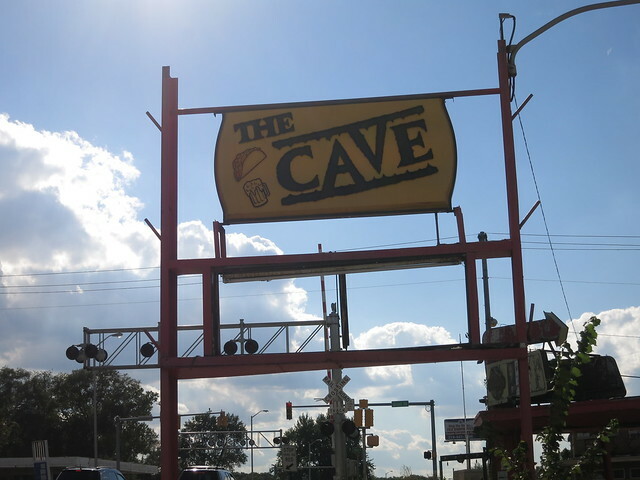 Indy Cafe isn't an example of a place that gets positive reviews just because it's located somewhere some people wouldn't expect to find quality food. 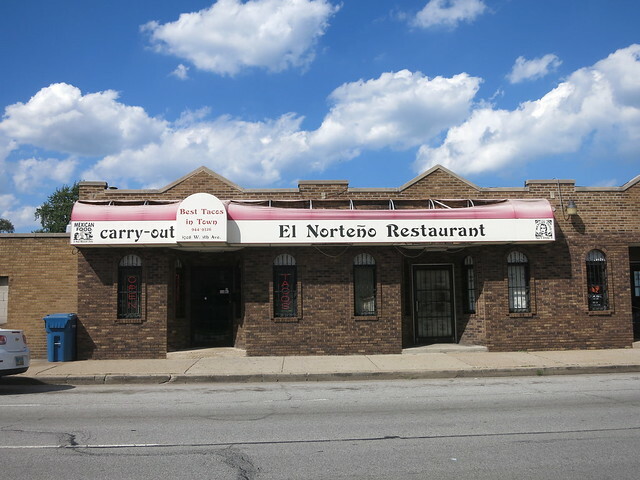 I'm not saying it's going to blow minds, but drop this restaurant off in any Chicago neighborhood and it would be a hit. 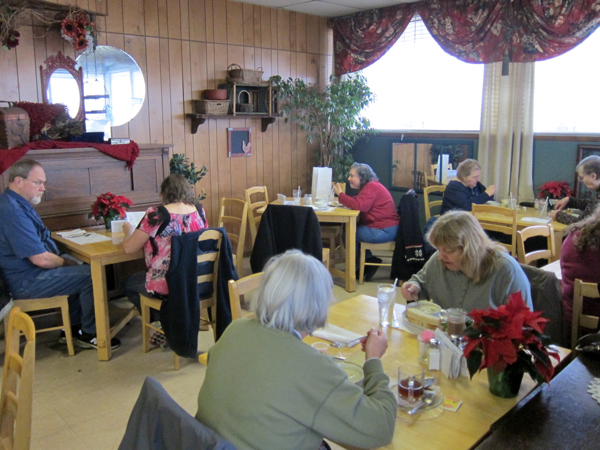 MarlaCollins'Husband wrote: A very happy first and definitely not last visit to Indy Cafe this weekend. This place should be in the regular rotation for folks heading out to Indiana and Michigan. Our first and last visit was mostly because the music was playing at deafening levels and the service was not what I'd call great...but most of the food WAS great. We might give it another try if they have turned down the volume. Can anyone verify if that's so? Thanks in advance! This July I moved to Chesterton Indiana so I'm happy to see some suggestions for food in NWI. I'm dying out here for decent Thai and Vietnamese places. If you have any suggestions let me know. It seems that Merrillville is the closest place to get any Thai or Vietnamese. If there are any other gems you know of, please do tell. that's my favorite wrote: Our first and last visit was mostly because the music was playing at deafening levels and the service was not what I'd call great...but most of the food WAS great. We might give it another try if they have turned down the volume. Can anyone verify if that's so? Thanks in advance! The music was on but not loud at all. buttercream wrote: This July I moved to Chesterton Indiana so I'm happy to see some suggestions for food in NWI. I'm dying out here for decent Thai and Vietnamese places. If you have any suggestions let me know. It seems that Merrillville is the closest place to get any Thai or Vietnamese. If there are any other gems you know of, please do tell. Hi "That's my Favorite!" So sad that I have to travel so far now for my Thai and Viet fix. Thanks for the Tao Chen suggestion. Tao Chen was one of the first places we checked out. We've also tried the only other Chinese restaurant which is Happy Wok (in the same parking lot). For a nice atmosphere, Tao Chen is definitely the best. We've eaten a couple family meals there which were good standard, Americanized Chinese. I do have to say that the beef in our Mongolian Beef was really strange (super soft like it had been frozen for too long). Happy Wok offers about 4 Thai dishes, 2 of which I've tried already (spicy Thai fried rice and pad thai). I also enjoyed their fish in black bean sauce. The hostess at Happy Wok said that the chef used to work in a Thai restaurant. i've STRONGLY encouraged her to have him expand the Thai selection. The pad thai I had there was surprisingly good in that it was not sweet, and had a strong shrimp paste kind of taste in it. Another nice discovery has been the jerk chicken stand at the European Market on Saturday. It's too bad the family that runs it doesn't have their own restaurant. "This July I moved to Chesterton Indiana . 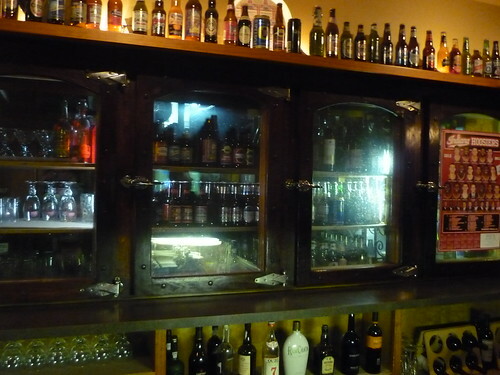 . . "
Let me put in a good word for the hamburgers at the Octave Grill on S. Calumet, also praised upthread, and their excellent selection of beers as well. But get your dessert at Dog Days Ice Cream up the street. Their salty-caramel-cashew-fudge is a delight (they may have other great flavors, too, but i couldn't pass that one up). it's one of the more comfortable, professional, technically proficient, community theaters around.